Published Sep 1991 by Marvel. "Shame" Part 3 of 6. Script by J.M. DeMatteis. Pencils and Inks by Sal Buscema. Cover by Sal Buscema. Part 3 of the Child Within storyline takes an interlude so the four main participants (Peter Parker, Harry Osborn, Vermin, and Dr. Kafka) can take an introspective look at their respective personal situations. Three of the four central figures begin to gain a sense of understanding and inner peace about their life circumstances. But the fourth one, the fourth one...becomes the Green Goblin! Oh my! 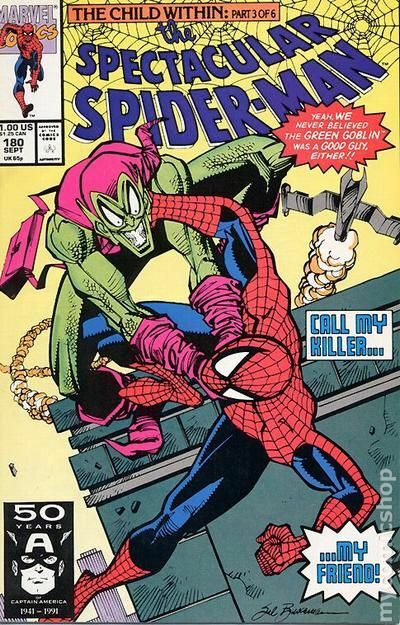 The Amazing Spider-Man and the Green Goblin throw down on the rooftops of Manhattan just like old times! 32 pages Cover price $1.00.